There is news coming out of the TV Shows on DVD web site that the long awaited final volume of the Voyage to the Bottom of the Sea Season 4 series is coming at the end of this year. This has been a long and frustrating wait for Voyage fans and this will be a wonderful Christmas present for all if/when it happens. The good news is that Warner Bros. have been working hard to get the fault sorted out on the Night The Bridge Fell Down DVD. A lot of fans are now receiving working replacements. If you still get a faulty DVD, contact the company you bought it from and ask for a working replacement. Warner Bros. customer services have been very helpful so we recommend buying directly from them or other reliable retailers such as Amazon who have a good reputation for customer service. 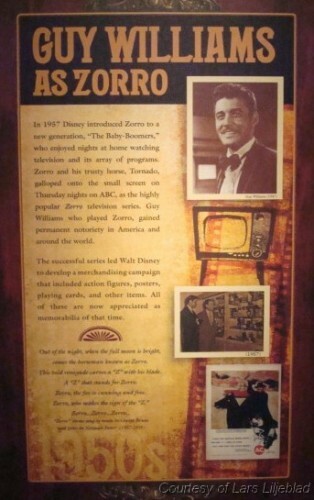 There is a Zorro exhibit being held at Mission San Juan Capistrano near San Diego until 31st August 2010. Guy Williams and Zorro fans may find this an interesting location to visit. Visit the link below to view photos from Lars and Cynthia Liljeblad’s visit to San Juan Capistrano. This past week you could have been forgiven for thinking you had landed in the Land of the Giants rather than London. Down at Trafalgar Square a gigantic sofa has been installed! Continuing the space type theme in this weeks Big Brother reality show, they have introduced 3 new house mates by landing them into the Big Brother garden by a Space Pod type vehicle!!! As the doors of this pod open, the house mates appear in silver space suits! To reassure you that Dr. Doug Phillips is a fictional character, check the date of the article! This week, the British Big Brother reality TV show has had a Robot themed task. Really wish they had considered having the Lost in Space Robot as part of the show. They have had another giant robot, Titan, competing against house mates in various tasks, and so far, the house mates have been victorious in three out of five tasks including smoothie making, hair cutting and egg whisking. The Titan robot however beat house mates in floor sweeping and inflating an airbed. Of course, the Titan robot had all the latest electric mod-cons whilst house mates had to use old fashioned hand tools. Interestingly, two separate house mates have mentioned “Lost in Space” as well as a couple going “Warning, Warning”. We have received confirmation that fans are starting to receive working versions of The Night the Bridge Fell Down DVD from the Warner Bros Online Store. If you bought a faulty copy from the Warner Bros store, we would recommend contacting them directly with your order number and ask how to obtain a replacement. If buying this DVD from any other outlets, we do advise that you first check that they are shipping working versions and not left-over faulty DVDs. We strongly recommend checking any replacement DVDs on arrival (check gets past 84 minutes into the second DVD), as some faulty copies are still being sent out by Warners. It’s possible that old and new stock are getting mixed up.